Customers - SwapLoader USA, Ltd.
After investigating ALL the hook-lift hoist options on the market, Rodney Thompson, owner of Thompson Landscaping Company chose one with integrity and a strong character. Rodney Thompson chose SwapLoader. The name Thompson Landscaping suggests that Rodney’s crew spends their days planting trees and bushes when in reality they spread their talents across many different markets including; construction, hazardous waste, demolition, and concrete. The ability to “swap” truck bodies ensures that the crew is busy all of the time and is defined as many things to many people. Rodney considers his SwapLoader the “hoist of choice” and is eager to demonstrate its functions at any time. He recalls a recent trip to the landfill – As Rodney dumped his first load, the guys at the scale house asked him to pull over to the side and wait there until they could come out and take pictures, they had never seen a truck that could do what Rodney’s SwapLoader could do. Quality, durability, and design were the most attractive features that Rodney recognized when making his decision. He likes the fact that you can control every function of the hoist from inside the cab and admires the ability he has to answer the call of duty whenever a customer calls, no matter what the job. York Township Department of Public Works maintains public infrastructure while providing various services to the approximate 26,000 residents. Mr. Scott Depoe, Director of Public Works of York Township, was introduced to the SwapLoader hook lift concept by SwapLoader distributor Bob Gates of Lancaster Truck Body in Lancaster, PA.
Once introduced to the SwapLoader concept there was no turning back. Mr. DePoe says that the SwapLoader model SL-330 has “allowed us to utilize one cab and chassis while doing the work of three vehicles”. York Twp. 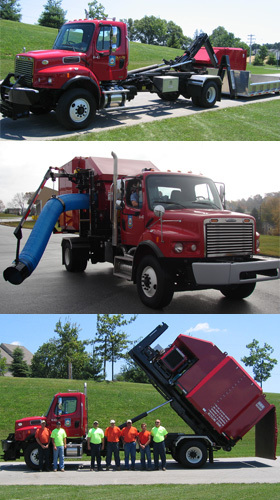 purchased a dual steer Freightliner equipped truck with an aluminum dump body and a leaf vacuum (ODB) for their day to day operations. They started off using the SwapLoader system primarily in the fall for collecting leaves curbside from Twp. residents but they quickly saw the versatility and now use it in their winter maintenance of spreading deicing material and use in general dump truck work as well.